Facebook Tips and Tricks: Create your "Facebook Business Card"
Create your "Facebook Business Card"
Over 800 million Facebook users access Facebook daily like their email. Out of them some are business people who are promoting their business via Facebook by creating "Business Fan Pages". If the online media is very much attracted to your products displayed in your business page in Facebook, then the display of that should be done on a physical thing that will represent the popularity of your business online. The physical thing that acts like a card (business card) which shows your Timeline, details about you and your business, etc. This is possible via "Facebook Business Cards". The image besides displays the proper Facebook business card which has important details like your photo, cover photo, name, location, etc. 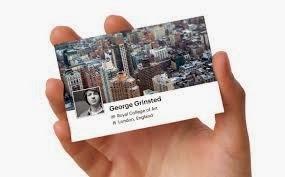 Showing your online professional presence using Facebook's Timeline should be made via an "Online Business Card" creator. And that is done by none other than "Moo" . Moo.com is a online printing business. Recently they have started creating "Facebook Business Cards" too. These Facebook cards are simple to make, with excellent quality that helps you show off your personality offline. How to create your own "Facebook Business Card"
Click on "Sign In "
You can use your Facebook account to sign in or you can create a different account in Moo. It will ask for permissions to access your profile. Click "Okay"
In the preview you can see that your profile photo with your cover photo is imported by Moo. Enter the space provided for additional information. Below you can see that your Facebook profile name with other details are imported. Click the "Flip" card button below to see front and back side. As you click the "Flip" button, both sides will be displayed one by one. Its now time for "Final Checklist" . Check the boxes as accordingly. The final step is to select the "Country" to send the business card via "Global Mail". To get your business card delivered to your location, you have to select the "Shipping options". Here you have the facility to select the two types of shipping options. They are Express and Standard. By default the option is set to "Standard" and its estimated date of shipping will be displayed. But if you want it to be delivered as soon as possible, then select the "Express" option which will be delivered before. But for that you will have to pay extra charges. Later on click "Continue" option. Enter the "Shipping Address "
Enter all the details in the address sections and click "Continue" . Enter the "Payment Details" and click "Continue"
Here we come to the end of the process. This will mail you the created Facebook Business Card to your location specified. This is an interesting touch to a typical business card. Companies that do this should use them with direct mail flyers, their uniqueness will really stand out. I know most companies don't like to invest in this marketing strategy anymore, but I still find it very resourceful and new technology like postage meters and folding systems can really cuts down the expenses. Just a thought on how to get these business cards and your companies social media fast exposure. I love your site! The informative blog on the topic, Business Cards and mining is really amazing..Thanks for sharing with us. Thank you !